Looking at Pertti Kujala, Mechanics Lead in Haltian, stereotypical thoughts about engineers are instantly taken for a quick check-up. He’s not the quiet type. He’s not a mild thinker, trudging onwards. He wears nothing but bright colors. And he talks about his passion all the time, pointing out little details that complete a design, or the immense focus he has on his work. Haltian is an IoT powerhouse, but the way things have to be made to fit sometimes escapes the mind of the consumer. These things can be tiny. They also must be durable, low-energy, and reasonably priced. Of all places, a perfect example of Pertti’s passion of making such things possible can soon be found on your bike. Although Pertti claims he’s not a cyclist himself (“although I’m quite keen on mountain biking”), he’s been long involved in one of the niftiest piece of pro-cycling gadgetry soon available. The Omata One is a high-tech multifunctional metering device for cyclists. Inside the surprisingly minimalistic low cylinder – very much like a speedometer, which of course it also is – Haltian’s sensors are included in the technology that measures speed, distance, ascent and time. Everything is designed to belong to a bike. Pertti has been leading the mechanics work on the globe-spanning project, working with Omata in the U.S. and Seiko in Japan. All this to be attached on a jittering bike in an environment probably not the most steady-going gave Pertti an astounding amount of responsibility. When doing something that is mere inches in diameter, has analogue gauge needles that mustn’t jiggle, and has to be extremely accurate in pretty rough going, the options for mechanic parts are few. 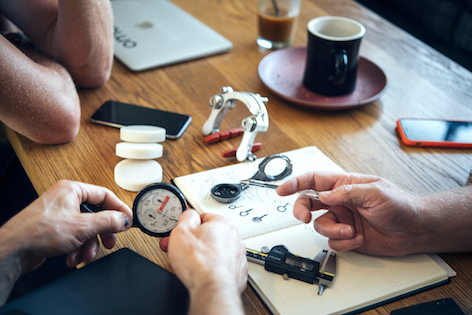 They contacted Swiss watchmakers, but the solutions weren’t durable enough for cycling, then car gauge manufacturers for durability, but the size was unthinkably large. “So we thought, ok then, let’s make it ourselves”, Pertti says and shrugs. It’s pretty obvious that the man loves what he’s doing in Haltian. This is a man who lives in a house that he’s designed and built himself; Pertti’s “hobby” is keeping his architectural studies alive and utilizing them (“I’m never going to graduate though”), as if being a perfectionist mechanics engineer isn’t enough. In the pictures, the house has a beautiful slanting, curved roof, and curiously enough, same kind of organic curve is visible when he shows a picture of a leather couch, which can easily sit six. The kitchen is alike, mimicking the outside profile of the house itself. The bathrooms are covered in plastic carpeting in bright base colours of red, green, yellow and blue. We’re not talking about someone who compromises – ever – in practicality or in aesthetics. The combination isn’t easy to do – the world is full of pretty things that don’t work so well, as well as uglier things for a purpose. Not in this case. Quite a lot of the decisions were met by robust “can’t do it” -verdicts from the professionals working on the house, but for Pertti, the page in the thesaurus that defines “giving up” has apparently been removed. So he did a lot himself, and found some brilliant talent to help him realize his visions. He says that nowadays, he’s bold to find new solutions, and some of his colleagues like being on the safe side – taking the tested approach, if you like. “That’s actually a good combination for finding faults in a design or a practice that’s in development.” The work goes much further than the layman might think. He’s not happy until the outcome is perfect. “Prototypes can be given to a man on the street and they’re like, ‘it’s ready, isn’t it’ – when there still is a lot of work to be done on perfecting the thing. 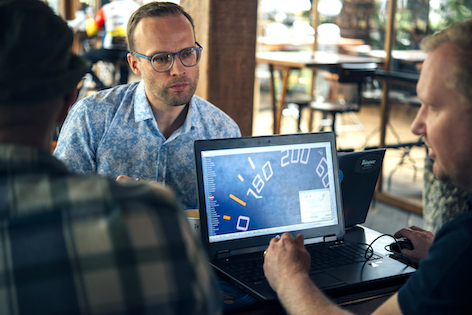 At Haltian Pertti works as a Director of Thingsee Business Development. On top of that role he also works as a Mechanics Lead in assigned customer products.